On this date (Aug. 28) in 1863, Joseph Macheca of New Orleans was tried and convicted in a Union military occupation court in connection with a scheme to steal and sell barrels of U.S. Army pork and beef. The barrels officially belonged to the 4th Massachusetts Regiment. They had been loaded aboard the steamship North America, a government transport, at Port Hudson, Louisiana (recently fallen to the Union forces after a 48-day siege). The North America steamed its cargo up the Mississippi River in support of the 4th Massachusetts' advance to Cairo, Louisiana. 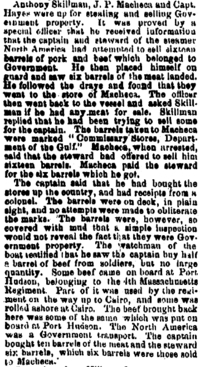 Remaining barrels were brought to New Orleans, and the ship captain and a steward sold some to Macheca for resale through the Macheca family produce store in the city. While other conspirators were sent to prison, young Macheca was merely ordered to pay a $50 fine. Joseph Macheca previously had enlisted for service in the Confederate Army and returned home to New Orleans in advance of the Union invasion of the city. Union occupiers generally controlled businesses and provisions in the region. The produce business of Macheca's step-father - a native of Malta and a British citizen - was one exception. Following his conviction, Macheca left New Orleans for Texas, where he reportedly gathered a small fortune through smuggling. Macheca returned after the Civil War and became a close ally of New Orleans Mafiosi while building a produce business and a shipping line. Macheca was among those charged, tried and acquitted of the 1890 assassination of Police Chief Hennessy. The New Orleans merchant was one of eleven prisoners murdered after Orleans Parish Prison was stormed by an anti-Mafia mob in 1891. On this date in 1891, one of nine accused Mafiosi, standing trial in New Orleans for plotting and carrying out the assassination of Police Chief David Hennessy, created a sensation in the courtroom. There had been just one day of prosecution testimony in the case, which began on Saturday, Feb. 28. 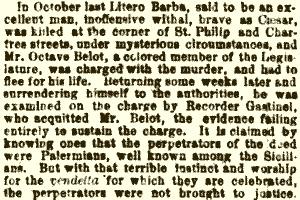 Manuel Polizzi already had been identified by witnesses as one of the five gunmen who participated in the October 1890 murder of the police chief. When brought into the courtroom with his codefendants on Monday morning, March 2, Polizzi hesitated to take his seat. He talked loudly in Italian and tried to get the attention of Judge Joshua Baker. Two deputies forced him to sit, but he once again stood and addressed Baker rapidly in his native tongue, waving his arms and punching at his own chest as he spoke. As a deputy attempted to force the defendant into his chair, Baker instructed, "Let him alone." The judge asked defendant Charles Matranga (the reputed leader of the regional Mafia organization and an accused accessory to the Hennessy assassination) what was happening. Matranga replied only that Polizzi wanted an interpreter. "Talk to him and find out what he wants," Baker said. Matranga and Polizzi exchanged a few words, and Matranga told the judge, "He don't want to talk to me." Baker then attempted to use defendant Joseph Macheca (a politically influential, Mafia-linked businessman who also was an indicted accessory in the Hennessy killing) as an interpreter, but Polizzi was entirely unreceptive to that as well. Before Baker could send for an independent interpreter, a defense attorney objected. 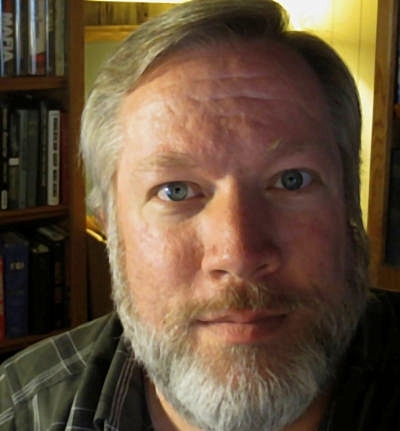 "We would like an opportunity to speak to this man ourselves," attorney Lionel Adams said. "He is our client and it is our right." Noting that Polizzi clearly had something he wished to express directly to the court, Baker brushed aside the complaint and sent for an interpreter. Baker met with Polizzi and the interpreter, as well as attorneys from both sides of the case, in his chambers. Polizzi's statement to the judge was kept secret. However, when the group returned to open court, defense counsel Thomas J. Semmes announced that the defense team could no longer represent Polizzi. That appeared to confirm the widespread suspicion that Polizzi was turning state's evidence, but prosecutors apparently were unimpressed with the quality of Polizzi's statement and did not separate him from the case. Lead prosecutor Charles H. Luzenberg would not comment on the matter. (Though he did not speak of it, thanks to an undercover Pinkerton operative inserted into the Orleans Parish Prison with the defendants, Luzenberg possessed information others did not have about Polizzi's mental state and its underlying causes.) Another defense attorney was selected to represent Polizzi, and the trial went on. Polizzi was visibly afraid and tried to keep away from his codefendants. The court agreed to Polizzi's request to be held in separate quarters from the other accused. Newspapermen learned that Polizzi made a confession "of a startling character" to Judge Baker, and they reported on his paranoid behavior. Defense attorneys told the press that Polizzi insisted both that he knew all about the conspiracy to murder Chief Hennessy and yet also took no part in the killing. They suggested that Polizzi was crazy. Reporters said they learned the defendant acknowledged being present when $4,000 was divided up among men selected to be the triggermen in the Hennessy assassination. He claimed, however, to have been at his home on Julia Street at the time witnesses saw him take part in the shooting of Chief Hennessy on Girod Street. Just a few days after giving his statement to Judge Baker, Polizzi created an even greater disturbance, as he had an emotional breakdown in open court. When he was removed to the office of the sheriff, he attempted to throw himself through a closed window. "Desperate Politz," New York World, March 7, 1891, p. 1. "Hennessy assassin confesses," New York Tribune, March 3, 1891, p. 1. "Hennessy murder," New Orleans Times-Democrat, March 3, 1891, p. 6. "Hennessy murder," New Orleans Times-Democrat, March 7, 1891, p. 3. "The Hennessy case," New Orleans Daily Picayune, March 3, 1891, p. 3. "Hennessy's murderers," St. Louis Post-Dispatch, March 6, 1891, p. 2. "The Mafia at bay," St. Louis Post-Dispatch, March 3, 1891, p. 2. "The New Orleans vendetta," New York Sun, March 3, 1891, p. 2. On this date in 1894, a federal jury returned a sealed verdict in a lawsuit related to an alleged New Orleans Mafia leader who was killed by a lynch mob three years earlier. Rocco Geraci was one of the eleven victims of the Crescent City lynchings at Orleans Parish Prison in March 1891. He was one of a total of eighteen men arrested and held for trial as principals and accessories in the assassination of local Police Chief David Hennessy. The lynchings occurred after a jury failed to convict a number of the accused assassins. 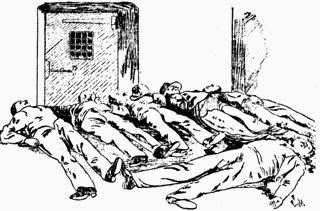 As a mob swarmed the prison on the morning of March 14, 1891, the warden opened the cells of the Italian prisoners and advised them to hide themselves as best they could within the institution. Seven prisoners, including Geraci, Pietro Monastero, Antonio Bagnetto, James Caruso, Loreto Comitis, Frank Romero and Charles Traina rushed toward the women's side of the prison. A well-armed group of New Orleans citizens soon arrived at the women's courtyard, and the seven Italians emerged from their hiding places and assembled in a group in the corner of the courtyard. Some crouched and others knelt, begging for mercy. At close range, the gunmen opened fire. A second volley was then fired into the group. Geraci was among the prisoners shot in the courtyard. All but Bagnetto were killed by the gunshots. The gunmen dragged Bagnetto outside the prison and hanged him from a tree. Three other prisoners were located and killed on an upper floor of the prison. One other prisoner was hanged from a lamppost outside the building. Suit was filed in the spring of 1892 against the City of New Orleans on behalf of Geraci's widow and their children. The city was charged with failing to adequately protect Geraci, a foreign national, while he was in government custody. Damages amounting to $30,000 were sought. The case was the sixth suit stemming from the lynching deaths to be heard in United States Circuit Court. Each of the previous plaintiffs had been awarded cash compensation from the municipality. Geraci heirs began presenting their case on Jan. 12, 1894. Their first obstacle was proving that the Rocco Geraci killed at the parish prison was the same person as the Francesco Geraci noted in public records. Police Captain John Journee and local businessman Joseph Provenzano were called to the stand to establish his identity. Testimony resumed the following day with Geraci's brother Salvatore and businessman J. Salomoni. Closing arguments were delivered by the plaintiffs' attorneys Chiapella and Sambola and city attorney O'Sullivan. As in previous cases, the charge delivered by Judge Alexander Boarman to the jurors left them little choice but to find in favor of the plaintiffs. The judge apparently felt $5,000 was an appropriate reparation - he had already allowed for several retrials of cases in which lower amounts were awarded. Jurors brought back their verdict just a bit late for the court session of Jan. 13. The verdict was therefore sealed. It was revealed as the court day opened on Jan. 14. The plaintiffs were victorious in the amount of $5,000. As a number of the related lawsuits were brought up for retrial, the City of New Orleans found new grounds for its defense. It successfully argued that the articles of Civil Code protected the municipality against suits relating to loss of life (though it specifically allowed suits relating to property damage). A retrial of the suit filed on behalf of the widow and children of Pietro Monastero was found by Judge Parlange to have no merit. In a 20-page decision, Parlange supported the city's position that it was exempt from such lawsuits. Read more about this topic in Deep Water: Joseph P. Macheca and the Birth of the American Mafia by Thomas Hunt and Martha Macheca Sheldon. of local Sicilian gang violence. On this date in 1868 - Returning home from a meeting of the Joseph Macheca-run Innocenti paramilitary organization, Litero Barba is shot to death. Barba is reputed to be a leader of a New Orleans criminal organization with its roots in Messina, Sicily. African-American political organizers in the Crescent City are initially believed responsible for the killing (the Innocenti, aligned with the city Democratic political machine, have conducted a series of violent raids upon Reconstruction Era African-American Republican groups). However, blame ultimately falls upon local Palermo-born Mafia boss Raffaele Agnello. The New Orleans Sicilian-American underworld fractures, as an alliance of Messinesi and Trapanesi opposes the Agnello Mafia. 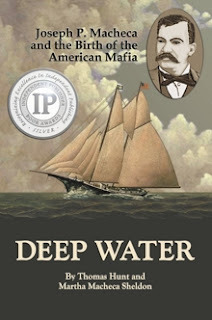 Read more about these events in Deep Water: Joseph P. Macheca and the Birth of the American Mafia by Thomas Hunt and Martha Macheca Sheldon.